Again some bananas waiting for their turn to be used up and thinking, if nobody is eating may be we'll get a good shake with milk......but wait it's snowing outside chances are very less to mingle with the milk......slowly turned black from outside, perfect for baking, may be now somebody will see us.......and finally lady of the house decided their faith.....Chocolate banana bread & mini bundt cakes with blueberries. Base recipe used here is of my other banana bread but this one was baked to mainly clear few things from the cooler-box and pantry. And it's very forgiving kind of recipe one can easily substitute with what they have in hand or how healthy they want to make it, butter can be totally left out from this recipe as banana works well as fat substitute. Addition of chocolate make it more acceptable by kids even when it has lots of good stuff in it. Please do check the notes at the end, as list of ingredients might make u think it's a very long recipe, which is not, only the list of ingredients is lengthy otherwise it's just mix & bake kind of recipe. 2 tablespoon butter at room temp. In a large bowl using a whisk, mix all the dry ingredients making sure that there are no lumps. Keep it aside. Make sure all the wet ingredients are at room temperature. In another bowl using a whisk mix butter, banana, ricotta and condensed milk till they are smooth. Slowly add buttermilk & 1/2 cup of water & again whisk them. Add dry ingredients to the wet mixture little at a time & keep mixing them till all the dry ingredients are mixed together with wet. It's kind of a thick batter but not too tight. So if needed use little extra water. Roll blueberries in 1/2 tablespoon flour. Fold berries & choco. chips to the batter. I added coconut flakes to only one loaf. So after filling the bundt pan & one loaf pan I folded coconut flakes to the batter. Pour it into greased pans & bake it in the 350 degree F oven, for timing check below and for filling bundt pan check notes. I made two small loaves & 12 mini bundt cakes out of this batter. 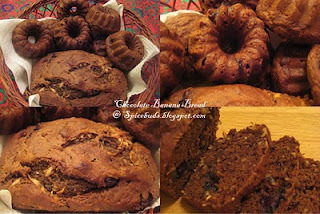 Mini bundt cakes or if U plan for cupcakes usually take around 16-18 minutes. For mini loaves, it took 30 minutes. I have used 3 different flours basic idea was to have around 2 cups of flour, recipe works well with only whole wheat flour also. So U can change the quantity of diff. flours, as long they measure 2 cups in total should work fine. In wet ingredients also I'm using quite a few things as I had to finish those & bread came out very good with addition of all those. U can check other version of banana bread here which is not using condensed milk & ricotta cheese and play with the recipe as per your taste. If using mini bundt pan filling the batter into small cavities can be little tricky & messy at the same time. So, here's the easy solution just fill a large Ziploc with the batter, cut 1 cm. from one corner & squeeze the batter out into cavities(fill only around 3/4) or if U happen to have large pastry bag use that. And don't throw the bag wash it, let it dry & use it next time when U again bake mini bundt cakes. Adorable bundt cake and delicious banana bread..yummm! Wonderful photos; I have been searching for mini bundt pans and mini springform pans; will now double my search. Cakes looks to be wonderful. Must have tasted great as well. Thanks Pratibha, Aruna & Priya. @ Sangeeta yes, choco. & winter goes hand in hand. Thank you so nuch for the information; we do have Wallmart and a Micheals in the area; I appreciate. love them.. those small ones are adorable! Lovely, lovely. I cant wait to make these! This is such a fantastic way to treat children to all these goodies and also let them have their good share of oats,I also liked the use of whole wheat flour combined with all the cake essentials-Chocolate chips,coconut flakes. Bookmarked :)!!! Spice, Thanks for the entry. Every time I see these mini bundt cakes, I want to buy the molds too. hey, spice.. that was an awesome recipe. cant wait to try it..